When I was on 57th Street and Fifth Avenue over the weekend with my mother, who was in NYC on a visit, I was looking for dynamite windows to photograph but none of them were knocking my socks off, surprising since this roundup included including Yves Saint Laurent, Louis Vuitton, Miu Miu, Burberry, Chanel, Tiffany and Bergdorf Goodman. 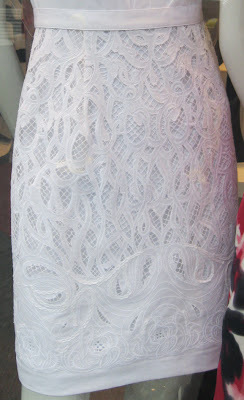 I did, however, spy on Madison Avenue on the Upper East Side this very pretty white dress with cutwork lace in the skirt. It's by Elie Tahari and I think it's the perfect summer date night dress. I don't have a white dress in my summer wardrobe but after seeing this one I want to correct that situation right away. Close-up of the skirt. I love this kind of detailing! Do you wear a lot of white in summer? Beautiful dress.I wear anything that makes me feel happy. I've been looking for a white dress, too. I've never owned one, but the blog posts about them--like this one--make me yearn. White isn't something I wear often, however. Without fail, I do something to mark it up! Hi Sacramento, you look happy in everything you wear and I especially love that you are never in jeans (which I wear way too often). Hi Catherine, I'm finding myself more drawn to white clothes too. I'm wading in with very pale pants and white t-shirts and hope to make it to a white dress very soon! Hi Mom! I'm still wiped out from our trips to the city too but was it good to see all those beautiful things last Sunday and lunch in the Cooper-Hewitt garden was divine. Beautiful dress!! I love white in the summer! !